Chief Probation Officer Doug Staulger at his desk Thursday. Staugler said that probation officers have moved to holding more interviews in their office instead of conducting home visits, because they can get through more cases in less time if the probationers come to them. Delaware Municipal Court probation officers now handle close to 300 cases at once because Delaware County’s growth and the heroin epidemic. Delaware Municipal Court Judge Marianne Hemmeter held a special lunch Wednesday to thank the six municipal probation officers for National Probation Week. Hemmeter said the six officers supervise close to 300 active probationers and conduct interviews, drug screenings and other check-ins with people on probation for a misdemeanor offense. The case load has grown in recent years both because of population and heroin. Doug Staugler, the chief probation officer, said cases that involve heroin have completely different probation protocols and are longer and more complicated. Likewise, Hemmeter said many misdemeanor crimes, like theft, are fueled by heroin and require a different kind of probation. Hemmeter said probation officers typically conduct home visits to check on their probationers because it gives them a better sense of that person. “We only see people in a courtroom and sometimes we get a completely different picture once we are in their home environment,” Hemmeter said. Hemmeter said home visits can also tell officers if probationers have other needs, like where their next meal is coming from. Staugler said the increased case load has meant that probation officers are doing less home visits and are instead calling probationers into their office. Hemmeter said in a perfect world, probation officers would have a mix of home visits and office appointments. Hemmeter said adding another probation officer would allow for more home visits and a decreased case load, but said the costs of another position is a significant factor. Hemmeter praised the work of the probation officers and said they have done a great job adapting to the needs of the office. 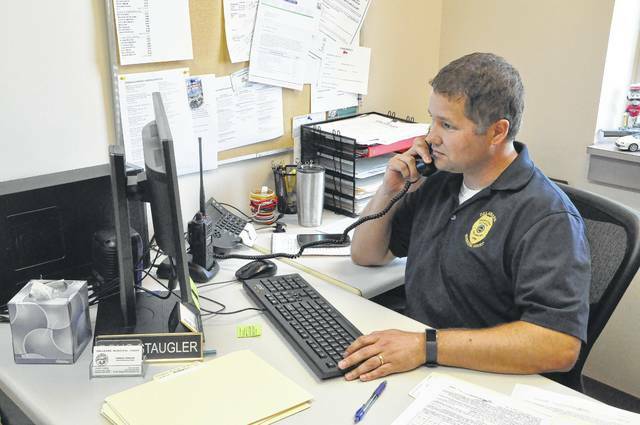 https://www.delgazette.com/wp-content/uploads/sites/40/2017/07/web1_DSC_0233.jpgChief Probation Officer Doug Staulger at his desk Thursday. Staugler said that probation officers have moved to holding more interviews in their office instead of conducting home visits, because they can get through more cases in less time if the probationers come to them.